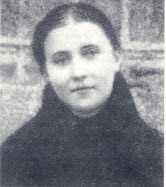 Preface: Oh most Divine Lord, we humbly prostrate ourselves before Thy Infinite Majesty, and we adore Thee and dedicate to Thy glory the devout prayers which we now present to Thee, as an act of devotion to your servant, St Gemma Galgani, whose intercession we are now imploring. Pray for us, Saint Gemma, that we may be made worthy of the promises of Christ. O worthy Spouse of the Lamb of God and faithful virgin St Gemma, you preserved the innocence and splendor of virginity, giving to the world a bright example of purity and the most exalted virtues. Look down with pity from thy high place in heaven upon us who confide in thee, as we implore thee for the favor we so ardently desire (mention request). Blessed St Gemma, you who by the will of God suffered the loss of both of your parents at a young age, and whom also suffered countless pains in body and spirit, teach us how to sacrifice and to suffer out of love for God, that we too may expiate our sins here on earth, and thereby become more worthy of the infinite treasure of being united with God in heaven. Oh glorious St Gemma, for years you greatly desired to enter the consecrated religious life, but God desired otherwise, telling you after many years that it was not to be, and thereby causing you such great disappointment. Yet, you accepted this great sacrifice and resigned yourself to the will of God. Teach us then, dear St Gemma, to accept the sacrifices and sufferings that God permits in our lives, especially those that are very much against our own will and desires. Oh holy saint of the Passion of Jesus, St Gemma, as a soul victim you were always pleading for the salvation of sinners. Obtain for us, we beg you, not only the grace that we are asking, if it would be God’s will (mention request) but most importantly obtain for us the conversion and salvation of our souls, so that someday we may be united with Jesus, Mary and you for all eternity. Oh most fervent St Gemma, so many times you shed countless tears over your sins, and sought constantly to do penance and to make reparation for them. 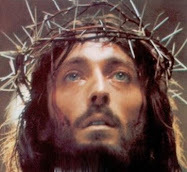 We who are so inclined to pamper ourselves, always seeking to gratify our senses and excuse ourselves from every penance, help us to recognize the infinite sufferings that Jesus endured for our sins, and all the pains we caused Him, and with the Passion of Jesus in mind, obtain for us a great sorrow and desire to never commit such sins again. 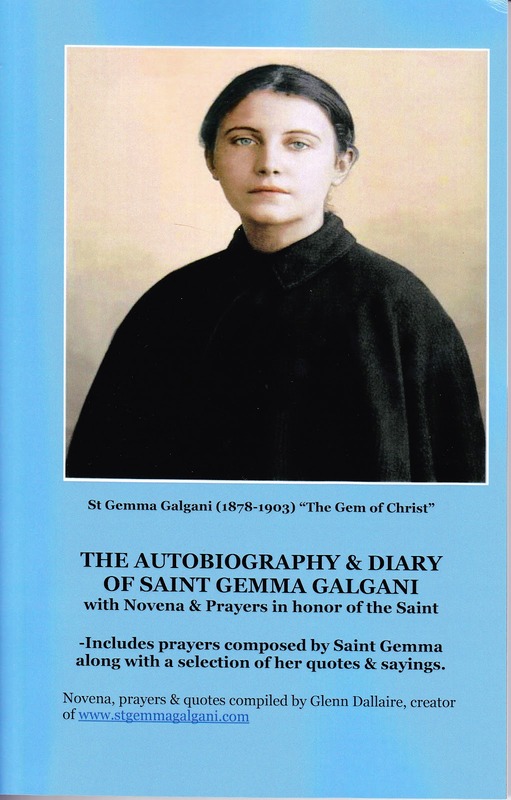 Preface: Oh most Divine Lord, we humbly prostrate ourselves before Thy Infinite Majesty, and we adore Thee and dedicate to Thy glory the devout prayers which we now present to Thee, as an act of devotion to your servant, Saint Gemma Galgani, whose intercession we are now imploring. Oh most lovable St Gemma, we ask you to be our patroness and special friend today and always. Assist us in our daily spiritual and material needs and teach us to know, love and serve the Lord our God with all our hearts. Accompany us, along with our guardian Angel, in all our ways, and guide us lovingly to Heaven. Assist us at the time of our death along with Jesus, Mary and Joseph, and plead our cause before God, and trusting in His great mercy and the Passion of Jesus thy Spouse, obtain for us the salvation of our souls, and also the favor that we now humbly request (mention request). Let us pray. O God, Who fashioned thy servant Saint Gemma into a likeness of Thy Crucified Son, grant us through her intercession the favor that we humbly request, and through the Passion, Death and Resurrection of Thy Son, may we be united with You for all eternity. 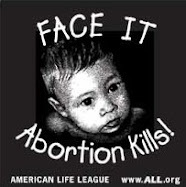 We ask this through Jesus Christ our Lord. Amen. St. Gemma ...I have loved her since watching her biography on EWTN a while back. Is that the same one that you saw? It is a pleasute to meet you. It is wonderful to hear of your devotion to St Gemma....Like you, I became devoted to her when I came across a her writings. She express her love for God so beautifully in her writings. One can't help but admire her. Thank you for wonderful website devoted to St Gemma. She is such an inspiration for us all to love our Lord Jesus more each day and she's helped me gain a better apprecation of what He suffered on our account. God bless you Glenn and all the good work you are doing to spread the message about St. Gemma's life and her love for our Lord Jesus. Thank you for your kind comments. I am very happy to hear that you are inspired by the life and love of St Gemma. I have begun a Novena to St. Gemma this week for a personal intention, and I invite others to join if they are so inclined. Just a little note to let you know that I will unite with you each day in your Novena intentions. May St. Gemma intercede for you, and may she be yours special advocate and heavenly friend. ~St. Gemma, pray for us! I stumbled upon your site while trying to research female saints. I'm in RCIA and was just told I needed to find a name. At first they said it could be of a saint that I have an affinity with but tonight they said I had to have a female saint since I'm female. The saint I have felt closest to is St. Michael the Archangel. Anyway, I'd like to stay with someone who practiced a spirituality in the way of St. Michael if possible. I know of St. Joan but there doesn't seem to be any resonance with me. Is there anything about St. MIchael with St. Gemma? I didn't see a search to check. If not, would you know of any other female saints that I might read about? Sorry but I'm having a hard time with this. It is a pleasure to meet you. I am glad to hear that you are coming into the Church through the RCIA program. In regards to a patron Saint, there are of course so many to choose from. Of course, each Sant is unique in their own personalities, spirituality, devotion...etc. Having prayed about it, I am sure God will inspire in your heart an interest in a particular one---the one who helps draw you closer to God by their heroic love for God...the one whose virtues inspire you...this is certainly the one to pick. As for myself, obviously St Gemma is the one who inspires me the most. She loved God with all her heart, to the point of great sacrifice, and she expressed her love for God so well in her diary and autobiography. When I first read a bit of her autobiography I said to myself "now THAT is how God is to be loved!! !..with all one's heart and mind." ---and I knew then that St Gemma was to be my patron and heavenly friend. And so, I would think that this is what you may want to look for in a patron Saint. May God bless you in your spiritual journey into His Church, and may He continue to draw you ever closer to Himself. Hi Glenn!I would like to thank you for all your effort in this blog. You are doing a lot for God and his saints.I am Mauro 37 years old married with one child.I would like to share to you my unusual experience about this St.Gemma. This happened last month .I was praying to God when will be the schedule for the christening of my 1 month old baby boy. Early in the morning around 5 am I dream of a big calendar in color blue with a highlight of number 16 then near it a name of a saint St.Gemma Galgani and I heard a voice reading it 3x.When I woke up I suddenly search it in the net and to my surprise May 16 was really a feast day celebration of the Passionist order for her.So this coming May 16 he will be baptize. I thank God for giving me the chance to know her through a dream. I bought a beautiful crucifix last week and have it blessed by a priest . I am now a devotee of her.As a matter of fact I will my start my first novena tomorrow. Congratulations to you and your husband on the birth of your son. And thank you for sharing the beautiful grace that you were given concerning May 16th and the upcoming Baptism of your son. By this grace it seems then that St Gemma is to be his special advocate, patroness and heavenly friend. May God bless you and your family and may He draw you ever closer to Himself. My Priest had a sense that St Gemma is a St I should walk with this year. I am excited to get to know St Gemma! I am glad to hear that your priest recommeneded St Gemma for a example of holiness to model yourself after. The more you read of her holy life the more you will be inspired by her extraordinary love for Jesus, and I am sure you will soon be rapt in admiration of this "Gem of Christ". I pray that she may lead you ever closer into the Heart of her beloved Jesus. HELLO, I HAVE WRITTEN BEFORE. COULD YOU PRAY THAT MY HUSBAND GETS A CHANCE FOR THIS NEW FACTORY JOB. IT IS LIKE WHAT HE DID BEFORE. I pray that your husband might get this job that he will be able to better support his family. I just found this site. Thank you so much for introducing me to Saint Gemma. Please pray for my husband that he may be able to start to have some relief from his continual and severe back pain. I pray that the Lord and Saint Gemma guide him and help him get comfort so that he may be able to find work. I pray that God will guide us though the paths that he has selected for each of us. Thanks for your comments. I am really glad that you found this website. As you have probaly read, St Gemma is a great Saint to pray to for those who suffer with back pain/injuries, because she suffered so much herself from severe back/spinal pain because of her severe spinal disease. I pray that St Gemma may interecede on behalf of your husbands back pain, and may she also help him to find gainful employment. Thanks for letting me know that you received the medals and holy cards safely--I am glad to hear that you are pleased with them. I pray that St Gemma may always be close to you and your loved ones, and may she lead you ever closer to Jesus. 2 days ago, i went to my mother's house , my sister was there and were discussing confirmation names for my 10 y.o. son. Whilst searching the internet for the saints name we stumbled upon St Gemma Galgani. What a treasure she was and still is. All three of us started reading St Gemma's autobiography and we were glued to the screen for hours. We love Gemma so much and can't stop finding out about her. We have purchased the autobiography of her life, is there anything else that you feel would be worthwhile buying. ?I am not working at the moment due to a painful back injury i sustained at work.THANK YOU SO MUCH FOR LETTING EVERYONE KNOW ABOUT THIS LITTLE GEM . March 12 will be the Birthday of St Gemma. I am a Novena to St. Gemma today in honour of her birthday and for a personal intention. I invite others to join if they are so inclined. Thanks for your comment. I am really glad to hear that you, your mom and your sister are enjoying the website and have become devoted to St Gemma---that is wonderful! I pray that Gemma may continue to inspire you, and may she lead you ever closer to Jesus, her beloved Spouse. Thanks for the suggestion about making a novena in honor of St Gemma's birthday, March 12th. -This is a great idea! I will surely join you beginning today. And of course along with her birthday another great time for a novena to St Gemma would be her feastday, April 11th, the anniversary of her holy death. I only got to know about St. Gemma last night from my mother. She mentioned that St. Gemma is the patron saint for those suffering from back and spine illnesses and that I share the same birthday with het. I then googled her and was led to this site. I started my novena to her today for her intercession. I have severe back pain due to multiple disc protrusions. Her life is an inspiration. I first found out about St Gemma in a Catholic magazine. I then found this website. This Saint has inspired and renewed my faith. I am reading her autobiography on this web site and I find her to be such an inspiration. She has made a profound and life changing influence on me.I will always pray to her and ask her for help. I also have made the novena to her. Thank you for introducing me to a Great Saint who wants to help all of us to love the Triune God and our Immaculate Mother more and more. 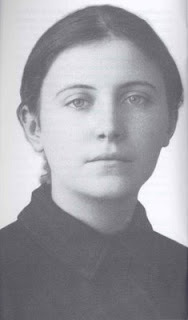 I pray and hope that more fervent, meek and patient souls will come to know our "little mom" Saint Gemma Galgani as she gathers her poor, little ones ...preparing their rendezvous with her in the Heart of God - permanently suffused with Divine Love. God bless, and God speed! I am glad to hear of your new found devotion to St Gemma. I pray that she may always be close to you and may she guide and inspire you, and lead you ever closer to Jesus and Mary. Our family prayed a Novena to St. Gemma for our unborn baby who was at high risk for birth defects, including heart anomalies. We just found out this morning the results of the last series of tests showed that all is normal with our baby boy. We give thanks ultimately to our God, but also for the intercessions of St. Gemma (and St. Blaise, to whom we also offered a Novena). O Most Holy Trinity, Father, Son and Holy Spirit, I love you so much, thank you so much for all the Heavenly Graces thou so lovingly our beloved St. Gemma. THank you so much for making her a glorious SAINT in heaven. Thank you so much for answering her prayers here on earth and in heaven. As we pray for the intercession of our beloved Saint Gemma, we gave you Glory, Honor Praise and Adoration O Most Holy Trinity. St. Gemma, you are the first saint to get my prayers. I am contemplating converting to Catholicism. This Novena, even though I probably did it wrong, worked for me - thank you for my new job at a GEM store. It made me feel like you were reaching out to me personally, and like you were listening. I will attend my local catholic churches, and see where this all goes. All love and gratitude to you. Can you tell me the actual feast day of St. GEMMA. Is it April 11th or May 16...I am confused. Saint Gemma's feast day is the anniversary of her holy death, which is April 11. The Passionist Community however celebrates it on May 16th (Gemma as you know is considered a lay Passionist). Thank you for your response Glenn. So if I want to make the Novenas to St. GEMMA what are the dates? If I wish to make Novenas to St. Gemma what are the precise dates then? I just discovered that St.Gemma is the patron saint of headache sufferers. At Mass this morning, I asked to be divinely lead to a solution.I have had chronic headaches since the mid 70' s. I will start the novena this very day. I have just finished the Novena after discovering St Gemma. I asked her to intercede on behalf of my 30 year old daughter whose health is very poor. I feel confident that Jesus will listen to St Gemma and that my beautiful daughter will be healed. My mother is having issues with her neck, which is nearly paralyzing her fingers. I've prayer the novena, I hope she gets healed without surgery. Having had the opportunity to visit Padre Pio's Church and home, I have always felt an affinity to him. In praying a Novena to him I feel he has led me to St. Gemma. I am grateful for this site in that it is allowing me to learn about this precious Saint. I have a severe back problem, and I pray she can assist me. I would like to order some prayer cards, and wanted to be sure this was still available. Thank you for all your work in this site. I am happy to hear that you have been led to St Gemma through the holy intercession of St Padre Pio (who by the way is one of my favorite Saints, along with St Gemma). I pray that St Gemma may intercede for you in regards to your back problem. To reply to your question, yes, I have lots of the St Gemma holy cards, so feel free to order whatever you may like. May God rain down His graces on you St. Henna and I thank you for your prayers for my injured friend. Please keep praying for her to be healed. May your name continue to be honored with all the saints in Heaven and may we all join you there to praise the Blessed Trinity forever!! Can I ask for prayers for my wife Julie. She has just had surgery on her spine to have a shattered disk removed as it was compressing the nerves in her spine causing Cauda Equina Syndrome. She is in less pain and can walk now but still numb in places and can't feel her bladder or bowels. Thanks for this site. So far i am on day 5 of st.gemma Novena and i see and feel a significant improvement. I never knew about Saint till today. I meant to say i never knew about saint until this site. I began the Novena 3 days ago, after failing an English test, asking St Gemma Galgani for her intercession since she's the Patron of students, & yesterday I get 100% on my Math & 90% On science !!! Nice grades on both tests!..great job!..St Gemma, pray for us. Hi, I asked a friend to remember my wife in prayer this morning as she is going into hospital due to her back. My friend told me to say a novena to St.Gemma. I found youe website and I will say the novena and I know that my wife will be healed. Thank you fordoing Gods work. May God bless you'll always. 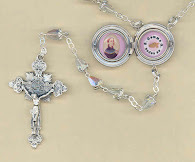 St.Gemma help me in this difficult situation. . Please keep me in your prayers amen. My son has been wearing a back brace for 9 months to correct kyphosis of the spine. It is now worse and he is to be re-evaluated for surgery if he does not show improvement. I found Saint Gemma in my research for support and a guide to help me deal with this for my son. He is a teen. Thank you for posting her novena and the prayers on your site. I will start them right away. I have faith that he will be healed without surgery. My name is Daniel. Please pray for me- I have chronic sciatica which has made the last 2 years of my life incredibly arduous and painful. I have prayed the novena to St. Gemma for perhaps a year or so and she has aided me considerably but pain and discomfort still persist. Thank you. I have seen her face so many times over the years and wanted to learn more about her. I always put it off for some reason. Then I got a Kindle and while looking for books to load onto it I came across her biography for $0.99 I couldn't pass it up! I am so glad I got it! I am so in love with her for her life and her way of life with Christ!! She has so inspired me and I can relate so much to her way like starting a novena and then having to restart it again and again! lol I hope I can one day get a relic of hers I know so many that could benefit with cures both corpral and spiritual I wish I had visited her when I was in Italy. But to much to see and the guys I was with had to go other places. I can also relate to her vocation. I too want to be a priest but now at my age no one wants me and my health is not good. In fact when it is pretty fair and I inquire with a vocation director I start to get sick! I am so glad I found this web site too!!! God Bless!! I am glad to see that Jesus has led to St Gemma! As you have read, like yourself Gemma too wanted to become a consecrated religious, but she was unable to due to illness and her "reputation" as someone who has received mystical gifts and graces. I pray that St Gemma may be close to you and may she lead you ever closer to Jesus. I first discovered glorious St. Gemma when I had a health scare regarding my back a few years ago. She heard my prayers and has become my dear dear friend since. I feel so lucky to have "found" her and will spend my life telling others about her. I have recently discovered saint Gemma and am on my seventh day of the novena. Am praying for my husband who has a double slipped disk and confined at home since January. Has had an injection but it was unsuccessful. Since starting novena he has noticed an improvement. This saint has left a great impression on me when i started reading about her life and she's on my mind a lot in the last few days since l discovered her.I pray to her with all my heart. Thankyou. I wish that St.Gemma would be my partner in my death..and St.Gemma bring me to Our Blessed Mother and finally bring me to Jesus to be see face to face! I just started today the novena to Saint Gemma for a personal intention. A very good friend of mine told me about her and I have read a summary of her life and devotion to Jesus. Of to Mass later on to celebrate St Gemma's Feast day! Thank you for this site . The novena to St Gemma is inspiring and has helped lessen my back pain . Please pray for me to be able to resume work. Please pray for my little baby boy. He is 8 months old and has to have surgery on his spinal cord. I have prayed a novena to St Gemma and feel much more calm. Thank you Jesus for St. Gemma. She is inspirational because of her similar trials. I am asking her for intervention for my children to keep a pure heart and for my friends who suffer from spinal and brain injuries. Thank you for your prayers. Is she the patron saint of the lonely? And if yes has she helped you? I'm in the midst of loneliness right now. Can anyone just please send me their insight on this to my whatsapp number +96898870745. I might not be able to get back to this site again i'm on mobile internet only. Thanks! Finished my novena about a week ago for my mother in law to be healed of intense mental issues due to a brain surgery. Heard from her and she is almost completely healed! A miracle! Thank you st. Gemma!!! Thank you, St. Gemma, for your friendship, your powerful intercession, and continually leading me closer to Jesus. I'm asking intercertion through st Gemma I am struggling with my study .I heard she's the patron of students . Thank you for your kind message--I am really glad to hear that you are enjoying the relic medal and books on St Gemma and St Pio. I pray that they may lead you ever closer to Jesus! Union in the Hearts of Jesus and Mary! Happy Feast Day, dear St. Gemma! You know all my needs, spiritual and temporal. Please pray for me and help me, if it is in accordance with His holy will. Please, everyone pray for Gemma in Trinidad whose husband is going blind, her daughter and grandson are virtually homeless,and two of her brothers died within a few months (one recently murdered). Hello came across St Gemma when I typed in about my constant migraines was so glad to find a prayer to help. Thank you St Gemma for your help and I pray that each person can get help with the intentions they have prayed for God Bless. Few years ago, I had a great attack on what to believe - if there is a God or not. And during those painful and dark times of my life, I have met ST. GEMMA GALGANI through through this site. Looking back, it made me realize how helpful this kind of blog you made. I knew she was praying for me, a wicked and wretched sinner, during those time. Truly, I am very grateful for this blog. Thank you so much! If you only knew what great good God and the Immaculate Blessed Virgin Mary with St. Gemma Galgani has brought to my soul. May God and the Immaculate Blessed Virgin Mary, Mother of God and Queen of Mercy, always bless you with Their love, mercy and tenderness all the days of your life! And may St. Gemma Galgani present to you to Our Lord and Father in Heaven! Thanks so much for your kind comments--I really love your "attitude of gratitude" which is surely pleasing to God. I am very happy to hear how Saint Gemma has brought you closer to Jesus and helped to inspire you in faith--thanks be to God for His infinite kindness and mercy! St Gemma, pray for us! Dear Gemma Galgani has helped me a lot in my life I received two holy cards from this site some time ago and praying them has helped me make contact with and converse with Gemma, accept advice and grow spiritually I could not give an high enough recommendation of St Gemma Galgani as an intercessor, adviser, guide and beloved big sister in Jesus, Mary and YHWH. OH POOR GEMMA (PRAY FOR US). I make this post in thanksgiving. This novena I began praying for a dear Sister and friend of mine. She has been suffering from back pain. I asked for St. Gemma's intercession to heal this Sister of her back pain and whatever else the Lord willed. This Sister wrote me this morning that she is doing better. She is out of the hospital and the pain she had has subsided. This pain she has struggled with off and on for a long time. She says she can move better! Praise the Lord and I want to thank with all my heart, my great Friend in Heaven, St. Gemma Galgani. May this be the beginning of an eternal friendship with you, St. Gemma. Thank you for your intercession. May God be praised! A glorious and blessed feast day in Heaven, dear Saint Gemma! I count on your powerful intercession with our beloved Jesus. I love you with all my heart. Thank you for helping us! Please help me to know the holy will of God for my life and the grace to carry it out. Thank you for all these beautiful testimonies. I have a young man named Chris who needs prayers from all for a complete healing. We ask St. Gemma to bring our intentions to the feet of Jesus and grant us this petition. He had surgery on he spine and is in rehab to learn how to walk again, God willing. Please all, pray this novena with me for Christopher. I thank St. GEMMA for relieving my son Ryan of his back pain as soon as I started the novena to her. I pray to her that he never gets that pain again and also for all who are suffering from backache.